Teenagers need a writing curriculum in high school that builds on basic skills and moves them toward true proficiency by including rich creative writing, powerful essays, and carefully crafted research papers. This is a full year downloadable .pdf writing curriculum for the growing writer (10th grade students and others with some experience but not a lot of confidence – Click here to see if our Introductory Guide to High School Writing would be the best place for your student to start.). Click here to view an excerpt from Intermediate Guide to High School Writing. Homeschoolers can develop confidence in their creativity skills by having some fun with their writing assignments using 7Sisters high school short story writing curriculum guides. Intermediate Guide to High School Short Story Writing: Tall Tales, is a 4-week, 26-page downloadable .pdf writing guide, written by Vicki Tillman to encourage students to capture their creativity by writing a tall tale. Success awaits with this high school short story writing curriculum! The lessons are designed for independent learning (or for use in a co-op). They are not time-consuming or full of busywork. Rather, homeschooling teens can feel not only creative but successful as they complete this guide. 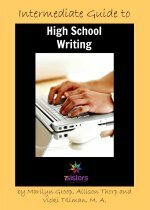 Click here to view an excerpt from Intermediate Guide to High School Story Writing. with our own students and hundreds in our local homeschool community over the years, we have seen success with writers of every variety.